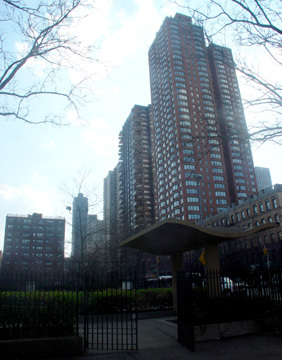 It is rare that a developer is able to built a clustered phalanx of major projects along an avenue in Manhattan, but Glenwood Management, which built this 38-story tower, has done that along the west side of the northern end of York Avenue. 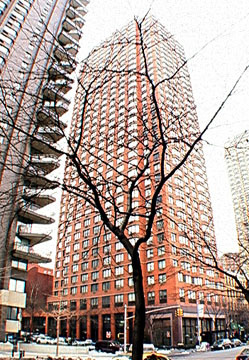 This building at 1735 York Avenue, which is also known as 437 East 90th Street, was erected in 1986 and the others nearby are the Andover at No. 1725, which was completed in 1974, the Barclay at No. 1755, which was completed in 1985, and the Brittany at No. 1775, which was completed in 1994. It is a rather interesting evolution. The first building, the Andover, is the only one with balconies. In this building, Glenwood shifted to bay windows, adding more at the Barclay and yet again more at the Brittany. The other major building in this stretch happens to be the most dramatic though the shortest of the group, East River Tower apartments at 1725, which is noted for its zig-zag balconies (designed by Horace Ginsbern & Associates). Like most Glenwood projects, this boasts a lot of amenities. It has a health club, a 24-hour doorman, a 24-hour garage with security guard, a sundeck, storage space, a bicycle room, video security, valet service, a recreation room, and a free shuttle to the subway on Lexington Avenue at 86th Street. This building, which is called the Hamilton, has eight apartments a floor and a total of 265 units. It was designed by Philip Birnbaum.